Nutrition and Hydration Week is taking place 14th – 20th March 2016 and my blog this month is focussed on this vital aspect of care provision. Continued Professional Education and Development. Food and drink is of course an essential component to physical and mental well-being and meeting the nutritional and hydration needs of people is a legal requirement under the Health and Social Care Act 2008, Regulations 2014. It requires care providers to both identify and meet the nutrition and hydration needs of people in their care. This includes taking into account likes, dislikes, preferences, and methods of taking nutrition and hydration, as well as considering religious and cultural backgrounds. Providing meals for many residents and their individual preferences in a reasonably short time period which is typically 1-2 hours per meal sitting. The staff team at Bridge House Care Home is committed to providing high-quality nutrition and hydration to all residents based on their individual needs and has a risk assessment process in place to identify malnutrition. 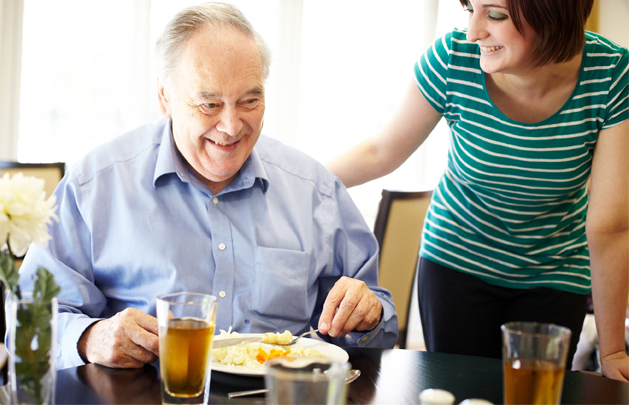 Care staff are fully trained on the subject and taught to understand how issues can arise, such as why people with dementia forget to eat or why they may lose food recognition. Low risk residents – weights are checked monthly, food and fluids intake does not need to be monitored closely. This procedure has proven very effective in that residents are achieving a healthy weight, they are appropriately hydrated and there is a significant reduction in the incidences of pressure sores, all of which are the result of effective nutrition and hydration.